Uttarayan is the latter half of a journey. Kusumavati, his first love… he had even penned a poem for her. How could he not go and meet her ! still manage that smile but she was lonely… just like Raghu. Raghu meets her more often. They share a bonding. Raghu is scared to believe that he wants to marry her. At this age? Should he ask her or just cling on to his son all his life ? since he was just a small, helpless orphan. In order to counter their vile intentions, Chikhloo was forced to resort to defense tactics. He soon learnt that offense is the best form of defense. He also realized that he possesses an inborn talent for mischief, and soon, what had begun as a mere means of survival, turned into divine enjoyment for Chikhloo. Now he thrives on causing tremendous angst to the villagers, and they have become his sworn enemies. Alas, Chikhloo is only half of the villagers’ worries. Their other nemesis is Bhutya, the dreaded ghost that haunts the jungles surrounding the village. In Mangalpada, every adversity… be it epidemic, accident, or death… is attributed to be Bhutya’s doing. They even deem Chikhloo to be an incarnate of Bhutya himself. “Why not?” thinks Chikhloo. If he joined forces with Bhutya, he would have an upper hand in his war against the villagers. And Chikhloo sets off into the jungles to meet Bhutya. Chikhloo meets Bhutya and finds him to be not so scary after all. Citing the villagers to be their common enemy, he lays before the ghost of the jungle, a profound proposal of partnership. Awed and amused by the boy’s gall, Bhutya agrees to be Chikhloo’s friend and to help him teach the villagers a lesson they would never forget. What follows is a heart-warming narrative of the warm friendship that develops between the boy and the ghost. And boy, are the villagers of Manglapada in for a shock??? Summer is in full swing! The kids are enjoying their vacation at home and at summer camps and classes. To add to their enjoyment, In addition to his writing, Dr Awachat is also proficient in some interesting hobbies like Origami, Drawing, String Games and playing flute. In this program, Dr Awachat will demonstrate these skills but will also teach some of them to the kids. In an informal program, the kids will meet a terrific grand-pa: a simpleton, easy-going, happy-go-lucky man who thoroughly enjoys his hobbies and takes efforts to acquire top-level proficiency in each of these activities. While actually showing how-to do some of the tricks with paper, pen and strings, Dr Awachat will also share some interesting experiences with all of us. Your kids are sure to have a lot of fun here and enjoy it. 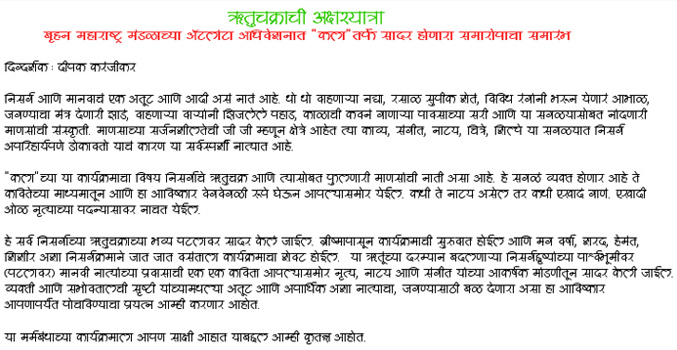 To any Marathi mind, Dr Anil Awachat needs no introduction! His multi-faceted personality is well-known to all of us through his books, social activities, and his involvement with Muktangan De-addiction Center and through his eye-opening articles in reputed publications in their Diwali Annual Issues. CalAA is proud to announce a program with this unusual Marathi author and activist on July 24th. In this informal session, Dr Awachat will talk about many topics covering his literature, experiences, hobbies and his thoughts about the current social situation in Maharashtra. You will have ample opportunities to ask questions to Dr Awachat and learn more about him. Sunday, July 24, 2005 from 1:30 p.m. to 4:30 p.m.
occasionally. On one such visit, he comes with an offer to revive a play done by Appa and his partner Bappa Ekbote for forty three years. deal. Although both hated each other, the play was a great success. The nephew wants to revive this play, with the same pair doing the original roles. How he brings them together, how they come together, what happens during the rehearsals and how it ends in the climax of the actual performance, brings out a terrific comedy. The way the partners-turned-enemies try to score points over each other gives us a fast-paced story, and innumerable funny occasions for the audience to laugh and enjoy. It is fun all the way, from the opening of the curtain to its close, yet the fun and the farce bring out the touching moments of the friendships and mutual admiration. The Drama begins with an episode about a drama producer approaching a writer for a new play. The writer expresses his inability to write meaningless comedies. The writer promises to write a woman oriented script where he would write about relationships in life. He writes about a young man Hriday who is looking for a committed relationship with Sarika. But his friend Guru is also looking for the same. At the same time a very simple friendship develops between Vicky and Sheena. The writer then tries to explore the flavor of the modern day relationships amongst young people. Their definition of serious relationships has changed completely. The writer looks at these changes with a very amusing point of view. Expectations of different individuals about a relationship in marriage are very different. Understanding and sacrifice form the very basis of any relationship. This is what the writer deduces at the end of the play. Relationships are fragile. They need to be carefully nurtured and developed. If this is done correctly, then relationships last a lifetime. If not, there is always a fear of them crumbling under pressure. Presented as a fast paced ‘Revue’, the drama focuses on the need for strong, meaningful and beautiful relationships in the ever changing world of today. Dance. Sangam is the word in Sanskrit that signifies the confluence of two rivers. The rivers being so original and independent in nature take their own courses, which are so different that one is often led to believe that there never would be a possible event when two rivers would ever meet. But, Mother Nature does spring her surprises by making the most unlikely events actually take place. The Sangam is a synchronized duet presentation of Kathak and Bharatanatyam styles of Indian Classical major rivers is also one such wonder of nature. Such place where the confluence or Sangam occurs is considered a very holy place by the Hindus and such confluence also marks the coming together of two cultures, traditions, thereby enhancing trust among the people. Such confluence most often is also believed to be the union of energies, just as that of Prakriti-Purusha (female and male principles in nature), Lord Shiva- Goddess Parwati. Devout Hindus throng the place of ‘Sangam’ to take a holy dip in rivers believing that it would rid them of all sins and help them attain ‘Moksha’ or salvation. The rich and prosperous Cauvery belt in the Southern part if the subcontinent houses the rich culture and tradition of this region too, causing the birth of the artistic geniuses of Carnatic music and Bharatanatyam. It was here that the art forms received utmost patronage during the times of Sarfoji Maharaja who ruled Tanjavur. The dance form was called ‘Sadir’ and was performed by Devdasis in temples, later on was performed in the courts of Kings, much later in the 1930s was once again revived and renamed as ‘Bharatanatyam’. The art form and the performers gained respect and recognition in society in the post-independence era due to the persistent and diligent efforts of Respected Smt. Rukmini Devi Arundale. Northern part of Peninsular India lies on the banks of the Ganges, and houses the resplendent tradition of Hindustani music and Kathak. Originally performed in the village temples of Northern India, in the course of time, Kathak sought refuge in the courts of Mughal Rulers. With the rise of the twentieth century, great Kathak maestros like Bindadin Maharaj and Kalka Maharaj took endless efforts to re-establish Kathak in its original devotional form and dignity. Today, Kathak is rightly recognized as one of the most developed and versatile dance forms of the country. also aims at portraying the divinity of the energies in the form of Shiva-Shakti and the Tandava-Lasya aspects of dance. enabling the audience to witness and experience the joys of rhythm and creativity. Shambhavi Vaze, the most sought after young Kathak danseuse from Pune, has had her training in Kathak dance from her mother and renowned Kathak Guru Mrs. Maneesha Sathe. She has also had extensive training in Laya- Taal and it’s aesthetics from none other than Taalyogi Pandit Suresh Talwalkar. She is trained in Hindustani vocal music with Guru Mrs. Mangala Vaidya. A commerce graduate from BMCC, Pune, she has excellent command over French and has completed MA in Performing Arts from Pune University’s Lalit Kala Kendra, with distinction. Gandharva Mahavidyalaya has honored her with three prizes for securing highest marks in all the centers of India in Nritya Alankaar Examination. As a soloist, she has widely performed in all the major cities and dance festivals of India, to name a few, Sharad Chandrika Festival in New Delhi, Swami Haridas Sangeet Sammelan, Raindrops Festival, All India Classical Dance Festival in Mumbai, Pt. Vasant Rao Deshpande Smriti Samaroha in Nagpur, Naad Surabhi Festival in Bangalore. With her mother, she has performed and conducted workshops thrice in USA, six times in Japan and in Bahrain too. A recipient of National Scholarship for Dance by Ministry of Human Resources, she has also been honored with Singaar Mani award. She is an empanelled dancer of Indian Council for Cultural Relations, New Delhi. She is also a member of the International Dance Council of UNESCO. She is a Mumbai Doordarshan graded artiste. She is a faculty and Guru in the Center for Performing Arts of University of Pune. She runs a Branch of Maneesha Nrityalaya Kathak Dance Institute for the past 13 years. Her choreographic works presented in various stage shows and on the television have brought her a unique recognition as a choreographer. faculty to the Dramatics Dept. and Dance Dept. of CPA, University of Pune. I am a 26-year-old male Indian classical dancer. I began my learning at the age of 4 ½ under Guru Rema Shrikant of kalakshetra style. I learnt for 15 years under her. Since 1998 I am continuing my training under Guru Dr.Sucheta Chapekar of Tanjavur style. I also did my masters in Bharatanatyam under her. My dissertation in the final year was “ Angika (Body Language) in Bharatanatyam from Bharata’s times till know”. The study of Angika(Body Language) is my area of interest. This study has led me to Guru Jayashree Rajagopalan (disciple of Dr. Padma Subrhamanyam) where I am also undergoing training in dance during Bharata’s times. 1) Indian dance as was present during Bharata, the most ancient scholar on dance, drama and music. 2) Indian dance as is present today, the principles behind the repertoire of Bharatanatyam. 3) Dance as it would evolve for tomorrow. 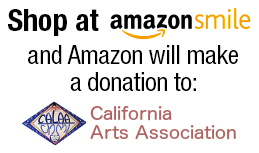 "A story of exploitation and abuse. Based on a real life incident where a journalist for Indian Express ‘bought’ a woman named Kamalaa at a marketplace to make a social statement about plight of women bought and sold in flesh trade and their life in slavery. 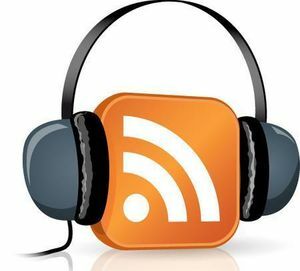 Tendulkar’s “Kamalaa” is that newsman’s slice-of-life drama with Tendulkar’s unique socio- political twist." Saint Tukaram wrote his verses on the Owari (Verandah) outside the Vithal Temple in his house, known as Anand Owari, a witness to most of Tukaram's life. Once, Tukaram has disappeared as usual possibly lost in some deep spiritual, philosophical trance. When his younger brother Kanhoba is not able to find him, he gets frantic with the thought that he may have 'lost' Tukaram forever. Kanhoba recalls Tukaram's spiritual journey, telling us about his life, his sensitive, revolutionary poetry and their relationship. Through his narrative, we come face to face with many perpetually important philosophical and social questions, realizing the validity of Tukaram's thought even today. Vijay Tendulkar has edited Di. Ba. Mokashi's novel for the play. Directed by Atul Pethe, this tour de force establishes Kishor Kadam as a fine actor. 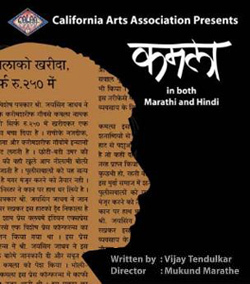 CalAA has produced a teleplay of this excellent play in its ongoing project of archival of top quality performing arts presentations in India. 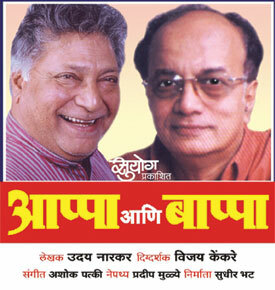 CalAA released a VCD of this outstanding presentation in Pune on January 24, 2005.